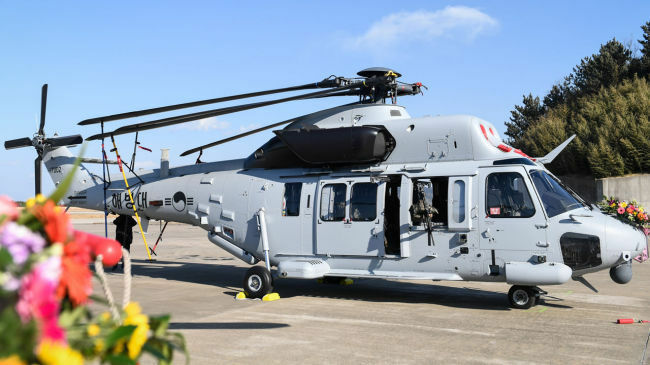 Korea Aerospace Industries, the nation’s sole aircraft manufacturer, said Friday that it would accept the findings of an investigation identifying a defective part as the cause of a Marine Corps chopper crash in July. After a monthslong probe, a team of civilian, government and military experts said a defective rotor mast on the Marineon chopper had caused the crash that killed five military personnel. The chopper crashed after the main rotor became detached from the airframe due to a crack in the rotor mast, they said. The French supplier of the part has admitted that the crack stemmed from an error in the manufacturing process, the team added. Offering an apology to the families of the deceased, KAI vowed to conduct thorough inspections. “After the accident, KAI and our suppliers have initiated a no-defect campaign and will strengthen the management process for safety features of planes in order to improve the quality of aircraft,” it said in a statement. KAI developed the Marineon with technological support from Airbus Helicopters. The choppers were delivered to the Marines in January with a plan to introduce 28 more by 2023.